HOUTZDALE – The Our Lady of the Valley Knights of Columbus Council No. 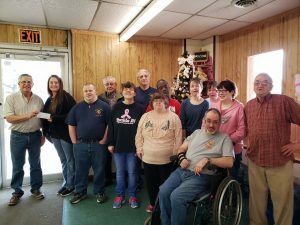 10376 recently presented a donation to the Angel’s Nest of Fayette Resources of Houtzdale. The donation was made to help with activities such as transportation and various activities for those in attendance. Receiving the donation from Grand Knight Jack Archer is Mrs. April Conklin of Fayette Resources. Also shown are council members James Belella, Leon Hansel and Frank Belella.